This pastor/pimp is a disgrace and needs to be slapped every ten minutes. Check out this letter that Creflo wrote to his sheeple. When a nation is on the brink of war, the worst thing its citizens can do is allow themselves to become divided. The Bible says that there is a time for war and a time for peace (Ecclesiastes 3:8). In fact, Jesus said that in the last days there would be wars and rumors of wars (Matthew 24:6). When this country was attacked on September 11, 2001, there was a fierce public outcry. America wanted her enemies to pay. Now, two years later, those same Americans are protesting the war against terrorism. President Bush is worthy of your prayers and support. He is a man who rises early every morning to seek God and His wisdom through prayer and the study of the Word. This is not the time for Christians to picket, carry protest signs or throw their opinions around. The election is over, and the man in the Oval Office is the one we, as Americans, voted in. Numbers 32:7-13 makes it clear how God feels about a nation divided during a time of war. This country needs unity, and it begins with the church. It is your responsibility as a believer to pray for the president, others in leadership, this nation, the men and women serving in the Armed Forces and our enemies--whoever they may be. Forget about your political affiliation or preference. You are first and foremost a Christian. * In the name of Jesus, I declare that I will not allow any corrupt communication to proceed out of my mouth concerning President Bush or others in leadership (Ephesians 4:29). * I declare that he is a man of wisdom, and he is strengthened and guided by the Holy Spirit. I wholeheartedly support the decisions he makes for this country (1 Timothy 2:1-2). * I lift up every man and woman serving in the Armed Forces. I declare that they walk in favor, wisdom and safety and that their lives are redeemed from destruction (Psalm 91:7; Psalm 103:1-6). If you have taken part in any protests or have allowed any corrupt communication to flow out of your mouth concerning the president, repent and begin to show your support for him by calling his name out before God. Pray for wisdom and wise counsel regarding the decisions he must make for this nation. Obey what the Word says in 1 Timothy 1-2 and 1 Peter 2:13 and: 1) continue to pray for those in authority over you; and 2) submit to that established authority. In doing so, you honor God, our president and thousands of service members. When the temptation comes to murmur or complain, rejoice that there is a man in the White House who walks and talks with God daily. Remember, united we stand, divided we fall (Matthew 12:25)! 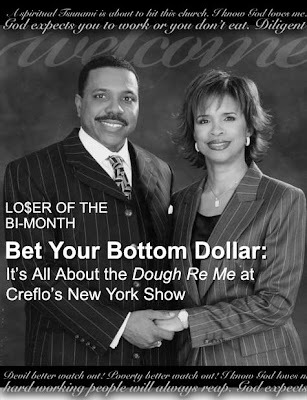 © 2000-2007 Creflo Dollar Ministries. All Rights Reserved.